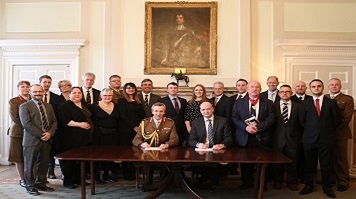 London South Bank University (LSBU) has been given an impressive Gold award for the University’s commitment to the Armed Forces Covenant (AFC) and actively supporting the armed forces community. The Ministry of Defence makes the awards through its ‘Defence Employer Recognition Scheme’ (ERS) to those employers who have demonstrated the absolute commitment of their staff, students and personnel to becoming reservists and supporting the work of the armed forces and their families. LSBU first signed up to the Armed Forces Covenant in February 2017. In less than two years, because of the University’s determined commitment to upholding the pledge, LSBU has progressed from a Bronze to a Gold award. Since 2017 LSBU has worked closely with staff and students from the Armed Forces Community to support their recruitment and retention. Most recently the work has been expanded into the local Boroughs working with Cadet Forces and local community groups to deliver accredited training to young learners. If you are interested in being involved in our work on the Armed Forces Covenant, please email sseafcov@lsbu.ac.uk. We have established a staff and student network and welcome interest from anybody who wants to engage with us.